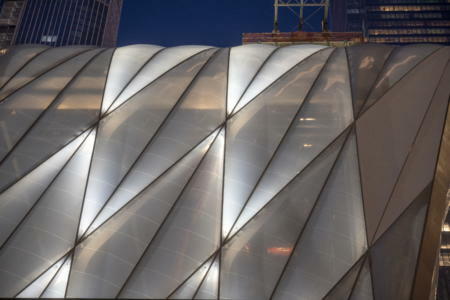 The shell of the Shed, Manhattan's new arts and cultural center, consists of 148 air-filled Texlon® ETFE foil cushions and an internal steel structure. The shell construction can be moved in its entirety via wheels. On 5 April this spectacular synthesis of the arts opened its doors. 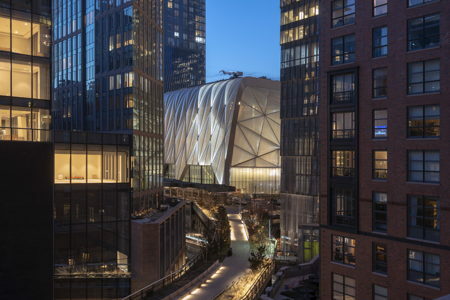 Directly on the High Line in Manhattan's new Hudson Yards business district, Diller Scofidio + Renfro in collaboration with Rockwell Group have created avant-garde architecture for art and pop culture with the Shed. This compact, eight-storey structure has a silvery, shining skin made of Texlon® ETFE foil cushions on the main building, and includes two pillar-free gallery levels totalling 2,300 square metres. There is a theatre that can be divided into several areas with up to 500 seats, as well as rehearsal and event spaces on the top floor. The architects’ idea was to design the Shed as a multifunctional and transformable building. The size of the venue can be nearly doubled by a movable steel roof construction covered in ETFE, allowing for large-scale installations, events and performances of all kinds. On both sides, the shell's structure rests on one double and two single axles, whose double wheels, the height of a man, are mounted on rails. Within five minutes, the structure, including the 148 ETFE cushions, can be moved across the 1,700-square-metre forecourt to the east. This creates a hall space called McCourt, which is designed for up to 2,700 people. It can be opened to the main building and to the outside via vertical and horizontal sliding gates. If the structure is "parked” over the building, the space can be used by the public, or for events with the membrane skin as a media projection surface. The design specification of the retractable building shell suggested a façade solution which has both a low net weight and high tolerances with respect to vibrations resulting from movement. 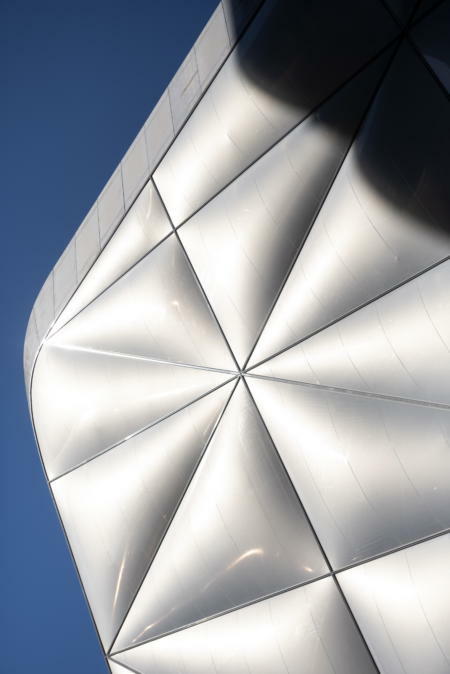 The architects therefore opted for a membrane skin based on the Texlon ® ETFE system by Vector Foiltec. 146 three-layer and two four-layer foil cushions cover a total area of 4,110 square metres. 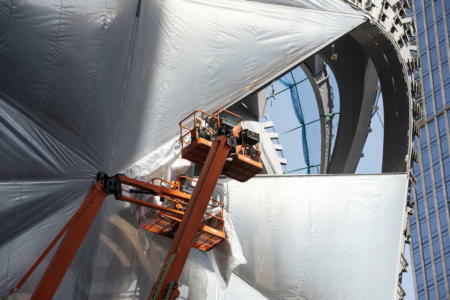 The two four-layer ETFE cushions are located on the north side at the very edge of the main building. Due to the extreme wind loads expected at this point, they are equipped with a patented load sharing valve. This also necessitated the use of an additional foil layer, which – just like the underlying foil – is 300 microns thick. Also exposed to high wind loads, are the adjacent three-layer cushions and the upper edge areas of the construction. Here the top foils are also 300 microns. The designers attached great importance to a homogeneous appearance of the shell. The cushions are therefore designed so that all foil seams run in a continuous line. 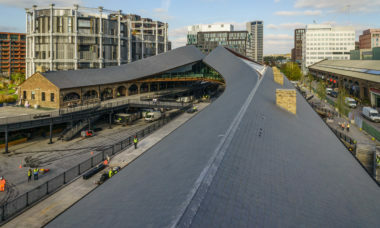 Another design specification involved the façade-roof interface, where the triangular ETFE foil cushions must curve over the structure at a 90-degree angle. Vector Foiltec engineering team used both computational and real models to achieve these transitions. They built a mock-up at the company site in Bremen, which was used to test the various cut options of the foil layers and ultimately generate the optimal solution. The fact that Vector Foiltec brings together all skills and capacities under one roof, from planning and development and production to project management, was certainly a key factor when it came to the commission for the Shed's shell. The type, colour and intensity of the foil prints were presented using a 1:1 mock-up in New York and specified with the designers in an intensive design process. A dot matrix printed on the top foil reflects strong solar radiation. The ETFE shell thus achieves a very low g-value of 0,40. It also protects the main building as a radiation-reflecting second skin. Since the printing on the top foils of the Texlon® ETFE cushions must not cast any shadows in the interior, so the centre foils were made translucent. Their white content is 29 percent. In order to ensure that the hall can be darkened and, at the same time, soundproofed, the Shed uses multi-layer fabric and textile membrane panels mounted on the inside of the steel support structure. The four air supply units (1300 x 800 x 750 mm) for the ETFE foil cushions, as well as all the event technology, are housed in the roof level of the steel structure. The air supply ducts were laid in a concealed way due to the elevations between the Texlon® ETFE system and the supporting structure. Another constructional feature of the Shed is the vertical cover profiles of the ETFE shell, which are designed as rails. For maintenance purposes, a roller system for raising and lowering a maintenance basket is mounted in the façade. A big challenge was the site logistics and the construction of the roof. Since the Shed borders directly on high-gloss buildings and the High Line, access roads and assembly rooms were very cramped. In addition, it was important to maintain high safety precautions to prevent damage to materials and adjacent architecture. Despite these challenges, the impressive construction was assembled in a tight time frame.